CULVER CITY, CALIF. (March 31, 2014) - George Clooney's action thriller The Monuments Men marches its way onto Blu-ray Combo pack, DVD and Digital* May 20 from Sony Pictures Home Entertainment. Based on the -non-fiction book of the same name by Robert M. Edsel with Bret Witter, the film pays tribute to the real men and women who risked their lives to recover and return thousands of cultural treasures stolen by the Nazis during World War II. The Blu-ray™ Combo Pack is loaded with bonus materials, including two all-new featurettes that highlight the making of the film. The first, "George Clooney's Mission," features interviews with Clooney, as well as the rest of the cast, -on the elements that went into completing The Monuments Men . The second featurette, "Marshaling the Cast," features a cast discussion on the real men and women they brought to life on screen. Exclusively available on the Blu-ray are two additional exclusive featurettes. "In Their Own Words" is a unique piece that offers the most comprehensive and direct insight into the hearts and minds of these heroes, featuring an interview with Harry Ettlinger, one of the last surviving members of the Monuments Men. "A Woman Amongst the Monuments Men" features a discussion with -Cate Blanchett on the historic, wartime female character she plays in the film (Claire Simone). Academy Award® winner Jean Dujardin (The Artist, Best Performance by an Actor in a Leading Role, 2011), -Bob Balaban (The Grand Budapest Hotel), Hugh Bonneville (TV's "Downton Abbey") and Academy Award® winner Cate Blanchett (Blue Jasmine, Best Performance by an Actress in a Leading Role, 2013). 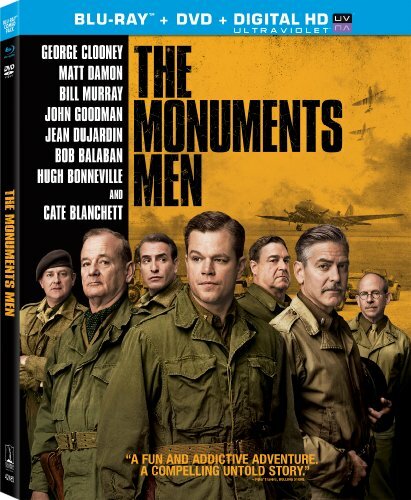 Based on the true story of the greatest treasure hunt in history, The Monuments Men focuses on an unlikely -World War II platoon, whose job it was to rescue artistic masterpieces from Nazi thieves so they could be returned to their rightful owners. In a seemingly impossible mission, the Monuments Men, as they were called, find themselves risking their lives in a race against time to avoid the destruction of 1,000 years of culture. Hitler had decreed that if he died and the war was lost, nearly 5 million pieces of stolen art were to be destroyed. -In an effort to thwart the Nazis' intent, President Roosevelt, with the support of General Eisenhower, created the MFAA (Monuments, Fine Arts and Archives) unit in 1943, and tasked them with the job of rescuing and protecting Europe's art masterpieces. Ultimately, more than 300 men and women worked in the MFAA between 1943 and 1951, -returning thousands of cultural items that had been looted or displaced during the war. The film has a run time of about 118 minutes. It is PG-13 for some images of war violence and historical smoking. UltraViolet™ is an entirely new way to collect and enjoy your digital entertainment, giving you the power to instantly access your movies and TV shows with unprecedented flexibility. For more information, visit www.uvvu.com.